Following its critically acclaimed West End revival, How The Other Half Loves will be playing at the Glasgow Theatre Royal in September 2017. 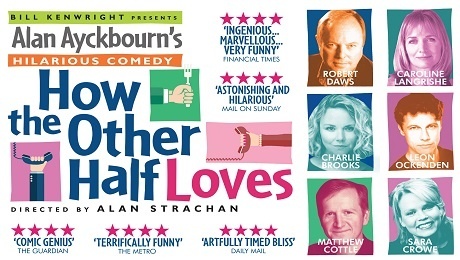 Alan Ayckbourn’s hilarious tale of matrimonial mishaps comes to Glasgow part of nationwide tour after a successful west end revival achieving the status of London’s funniest comedy of 2016. How The Other Half is a single set, which represents two separate but over-lapping living rooms. One is a smart room with reproduction period furniture (the Fosters’ home); the other more contemporary and shabby (The Phillips’ home). The play concerns three couples: Frank and Fiona Foster; Bob and Teresa Phillips; William and Mary Featherstone. The star cast includes leading stage and TV actors Robert Daws, Caroline Langrishe, Matthew Cottle, Sara Crowe, Charlie Brooks and Leon Ockenden.